Labour’s poll average is now nudging 36% (more on this tomorrow), which will please those in the party who believe in what’s been dubbed the “35% strategy”. Advocates of such an approach argue Labour shouldn’t worry about trying to build a grand coalition of support to win the election. All it needs to do is attract and retain around 35% of voters, and that will be enough. It would be enough for victory, certainly. A victory by what kind of margin is another matter. 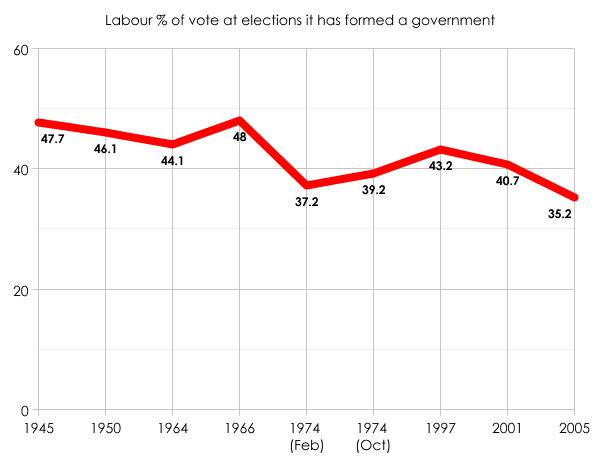 Labour formed a government with a majority of 66 at the 2005 general election with a 35.2% share. But when it achieved a 46.1% share at the 1950 general election, Labour formed a government with a majority of only five. It would be perfectly possible for Labour to win a majority next year on a share of the vote lower than all of these – so long as the Tories are around three percentage points behind them. For example, were Labour to get 33% next year, the Tories 30% and the Lib Dems 15%, on a uniform swing Labour would end up with an overall majority of around 10 seats. Were both Labour and the Tories to get 33%, with the Lib Dems still on 15%, you’d probably get a hung parliament with Labour the largest party. If Labour got 33% and the Tories got 35%, you’d still get a hung parliament with Labour the largest party. 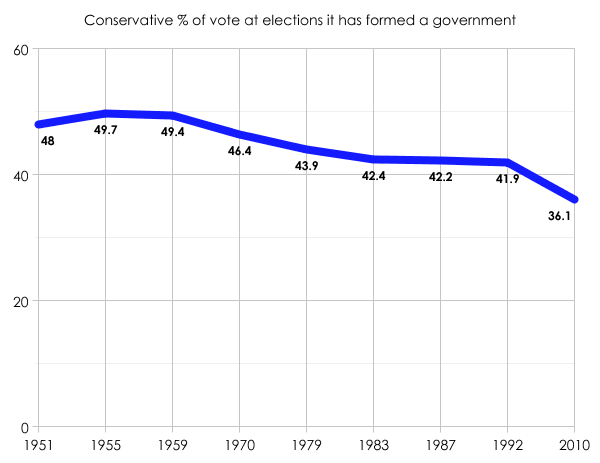 It’s a not uncommon observation that the Tories’ share of the vote has declined sequentially in every election since 1955 in which it has ended up in government. And it is a persuasive trend. Even during the Thatcher years, the share of the vote continued to fall, albeit not as as rapidly as during other decades. If this trend continues, it will be incredibly tricky for the Tories to win next year – or even end up the largest party. A 35% strategy won’t do for the Conservatives. Unlike Labour, the Tories need to be on 36% to at least be in with a chance of dictating the terms of a new coalition. Why the inequality of outcomes? The answer is to do with the vagaries of our electoral system, constituency boundaries and population distribution. In short, Labour’s share of the vote tends to be spread more evenly than that of the Conservatives. A lot of Tory votes pile up in safe constituencies; Labour can win more seats on a lower national share as a consequence. 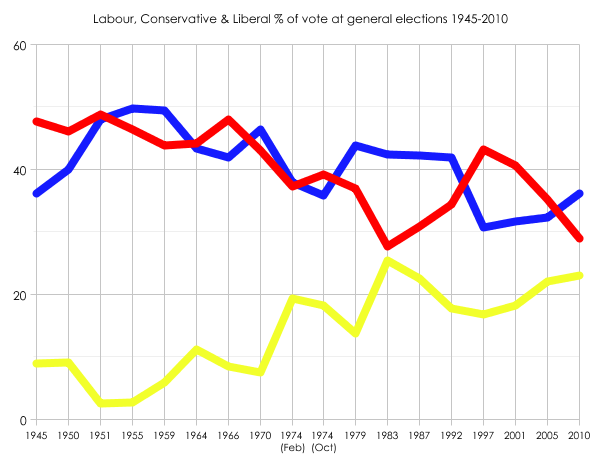 In 1951, Labour and the Conservatives’ combined share of the vote totalled 96.8%. In 2010 it was 65.1%. Maybe it’s not a question of whether Labour is right to go for a 35% strategy, but more whether any party can ever win more than 35% in a general election again. If the answer is no, then Labour’s decision suddenly seems less shamelessly cynical and more ruthlessly pragmatic.